Twelve years ago today, I started this blog. That was on blogspot – believe it or not, it still exists; truly, the Internet is forever – and a few months later I had my own domain. I don’t do retrospectives, I don’t have a list of favorite or “most popular” posts readily available, and sometimes I don’t even remember to mark my blogging anniversaries, but I figured I ought to mention it this time, as I enter my baker’s dozenth year at it. I tend to be a creature of habit, and when I find something I like that works for me, I just keep doing it. That’s the basic answer to the question of why I do this and how long I plan to keep doing it. It’s fun, I get something out of it, I’d miss it if I weren’t doing it, so I have no plans to stop. The day when those things are no longer true will come, but it’s not on my radar just yet. One of the things I have enjoyed getting from this blog is a long list of friendships and acquaintances from across the political spectrum and in media, traditional and otherwise. I’ve gotten to meet a whole lot more people in real life because of this Internet thing than I could have without it. I’ve gotten to be on TV – I’ll be doing another episode of Red, White, and Blue to be aired on January 17 – and on radio – I’m doing another segment of “The Good, The Bad, and The Ugly” for Houston Matters for this Friday, the 3rd – and discovered that I enjoy doing those things as well. More recently, I discovered that I have achieved the pinnacle of Internet fame when I stumbled across a Wikipedia page for this blog. I swear on whatever you have handy that I had nothing to do with that, and that I have no idea who created it. Most of all, I enjoy the feedback I get from you, my readers. It still amazes me that there are people who read this blog. Thank you for doing so, thank you for commenting, and especially thank you for letting me know when I’ve got something wrong, and when I’ve got something right. I’d probably still write this thing if all my words were going into a big void, but it’s a lot more fun this way. As a reminder, there are multiple ways you can be notified about new posts on this blog. There’s good old fashioned RSS, there’s the Off the Kuff Twitter feed, and there’s the Off the Kuff Facebook page, which has 422 followers and which I’d dearly love to get to 500, if you’re so inclined. But however you access this blog, thank you for doing so, and thank you for coming back. Here’s to another fun year. As of today, I have been writing this blog for eleven years. One runs out of dinosaur analogies after awhile, so let’s say that in Internet terms, this blog appeared at about the same time as the trilobite. I don’t have anything deep to say, just a thank you to all of you who read this blog, and especially those of you that respond to what I write. I learn more from the feedback I get than anything else I do here. I’ve met a lot of interesting people and made a number of good friends through this blog, and I continue to enjoy the writing that I do. Thanks for helping to make this as much fun as it has been and continues to be. Happy New Year, y’all. The Leader newspaper did a feature story on me that’s in this week’s edition. If you want an unvarnished look at what I do on this site, complete with an action photo of me at the computer, this is for you. Even better, there’s a picture of me with Tiffany and the girls, who are the real brains behind the operation here. Check it out. This is just a friendly reminder that you can find much of this blog’s content on the official Off the Kuff Facebook page, which I hope you will like. I was asked recently what the purpose of that page was, and the answer is that I wanted to provide another way for people to get the content that I provide here. Some people (like me) like RSS feeds, some people like Twitter (the Twitter feed for this blog is @offthekuff, as noted on the sidebar), and some people like Facebook. It’s good to have options, right? For those of you who like the Off the Kuff Facebook page, I generally try to add a little something extra most days – I’ll share a link to some other blog post or story that I want to share but don’t necessarily want to devote a full post to, or I’ll write an add-on to a post like this story about my inept effort to do the first candidate interview of the 2012 cycle. I may also ask for feedback about specific things I’m doing or thinking about doing here, such as my recent decision to include more pictures on the blog. It’s an ongoing experiment, which adds some fun and some challenge for me, always nice to have after doing the same thing for a decade. Feedback is always appreciated, here or on the Facebook page, so please let me know what you think. Thanks very much. Happy 2011! I suppose this is as good a place as any to mention that today is my ninth anniversary of blogging. I’ve been doing this so long I’ve forgotten how not to do it. I suppose I ought to think about having some kind of celebration to mark the 10th anniversary next year. Let me get back to you on that. I’m back from my secure undisclosed location (the Hudson River Valley in Dutchess County, New York – it was gorgeous, and I’ll have more to say about it shortly) and as I work my way through a zillion unread items in my feed readers and just generally catch up on the news, I’ll be getting back to regular posting. My sincere thanks to Greg Wythe for keeping an eye on things and posting some updates, to the makers of WordPress for their “Schedule” feature, and to you for sticking around. I’ll be back with more later. Hey, want to be a political blogger? Have you ever looked around at the political blogging landscape and said to yourself “I can do that”? Ever wondered how you could get paid to do it? Well, the Houston Press is looking for someone to fill their political blogger beat, and if you’re reading this, it could be you. Drop a note to Rich Connelly at Rich.Connelly@houstonpress.com and see if you’ve got what it takes. Good luck! If you’re getting tired of reading what I’ve got to say and would rather hear me say it out loud, come to the Houston Area Table meeting this Tuesday, January 19 and see if I sound any better that way. 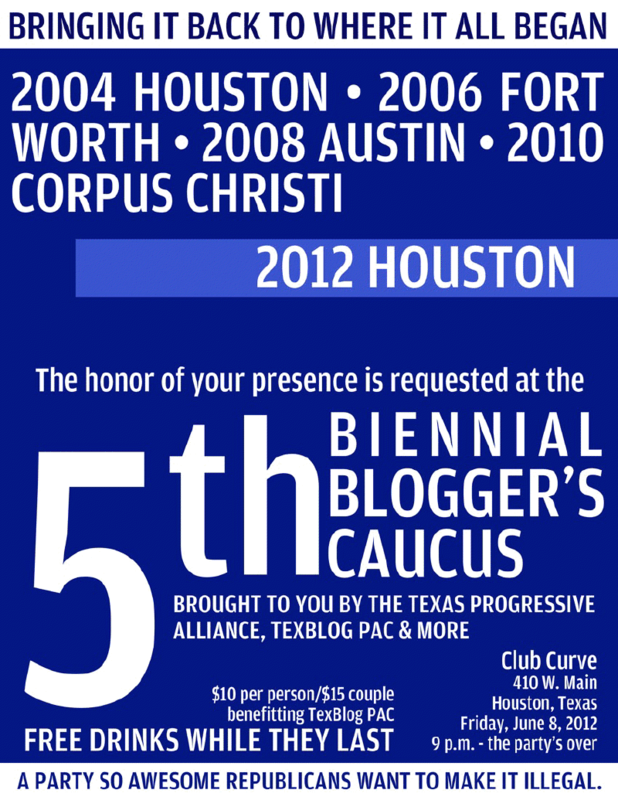 Houston’s top bloggers will share post-election insight into how the 2009 voter mandate will shape City policy and the use of new media in political campaigns. January 19, 2010 11:30-1:00 p.m.
Feel free to bring a lunch and invite a friend. About the Houston Area Table: The Houston Area Table (HAT) is dedicated to fostering communication and cooperation amongHouston area organizations and non-profits. Beginning in 2010 HAT meets monthly on the third Tuesday at the United Way. There will be no meeting in July. Here’s a map to the location, and here’s the Facebook event if you want to join in that way. Hope to see you there! So how is Speaker Joe Straus doing? Three months into his first term leading the 150-member chamber, Republican Speaker Joe Straus is emerging as a bipartisan compromise-seeker, rejecting much of the power that his predecessor so coveted. Straus still faces some tough tests, but just four years after Craddick was anointed as the most powerful Texan by Texas Monthly magazine, observers say the young GOP leader has shifted power back to the House. Straus’ first big victory came last week when the normally raucous House unanimously approved the $178 billion budget. It was the first time in a decade that the usually thorny state budget came out with 149-0 approval. In a rare sit-down, on-the-record interview with The Associated Press, Straus said the unanimous vote was the result of weeks of negotiations and compromise. “No one, right or left, Republican or Democrat, urban or rural, is going to crush somebody by sheer force this session,” said Straus, the state’s first Jewish speaker. I’d say that’s a fair interpretation. As I’ve said before, Straus hasn’t been exactly what I’d hoped for in a non-Tom Craddick Speaker, but he’s still a lot better than Tom Craddick. The House has been remarkably free of strife, and more importantly it’s been completely free of attempts by the Speaker to impose his will on everything in his path. That’s as much a function of the near-even split as anything else, but the point is that Craddick couldn’t have managed under those conditions; he would have been what he has always been. The House would have been a disaster area with him in charge. Of course, there’s still a lot of time left, and at least one big stinking partisan blob of an “issue” that remains unresolved. Lately, Straus has been working to forge a compromise on an effort to strengthen voter identification requirements, a measure so divisive it sparked partisan meltdown in the Senate and triggered threats of lawsuits. I’m hearing from Capitol sources that Rep. Todd Smith, R-Euless, privately told GOP colleagues today he’d reached closure on his intended-to-be-a-compromise version of voter ID legislation and might even issue an afternoon press release saying so. Their beef: They’d prefer not to see Smith, chairman of the House Committee on Elections, running out a softened-up approach that they don’t think meets the intended ID mandate. True, it’d be a painful political boomerang for Republicans to see House Democrats (on the short end of the 76-74 House split between the parties) wrest control of the GOP’s most-valued legislative proposal (though the flip side, perhaps fueling Smith’s hunt for common ground, is that if the Senate-approved version of voter ID isn’t tweaked, he could fall short of getting the proposal out of his committee or off the House floor; tough cookies). Until Smith speaks out (yup, I’ve tried to reach him), I’m left with separate statements from Rep. Betty Brown, R-Terrell, who takes a hard line on the voter ID front, and from 51 House Republicans (including Brown) similarly saying they’re not interested in phasing in changes or making it easier for most anyone to vote without presenting proof of their identity. GOP blow-up? I’m waiting to hear more. For what it’s worth, Rep. Smith says it was all sweetness and light when he addressed the caucus about his bill. Sure it was. I can’t think of a better resolution to this mess than a GOP implosion as no bill gets passed because the hardliners refuse to accept a compromise, while their version fails to get enough votes. Nothing could illustrate the point that this is all just a naked partisan power grab than that. Form a circle, Republicans, and load up those AK-47s! We’ll start popping the popcorn now. This may not look like much, but given that Debutant has been in the ICU at MD Anderson since Thanksgiving and has nearly died multiple times, I think it’s pretty damn amazing. Please go leave some good thoughts for an incredibly resilient woman. And if you get the chance, make an appointment to give some blood. Thanks very much.